Welcome to Tribute Month! This month is all about sharing the spotlight and saying who inspires our sewing. This doesn’t just mean copying something or someone exactly (though you can if you want!) but thinking about other sewcialists that plant a little seed of an idea in your head. For example, I have a make awaiting good photos that were inspired by another blogger but the finished garment I made is SO different from her wardrobe; I don’t think the blogger I was inspired by would be seen dead in my make, but hopefully she would appreciate the process I took from her! 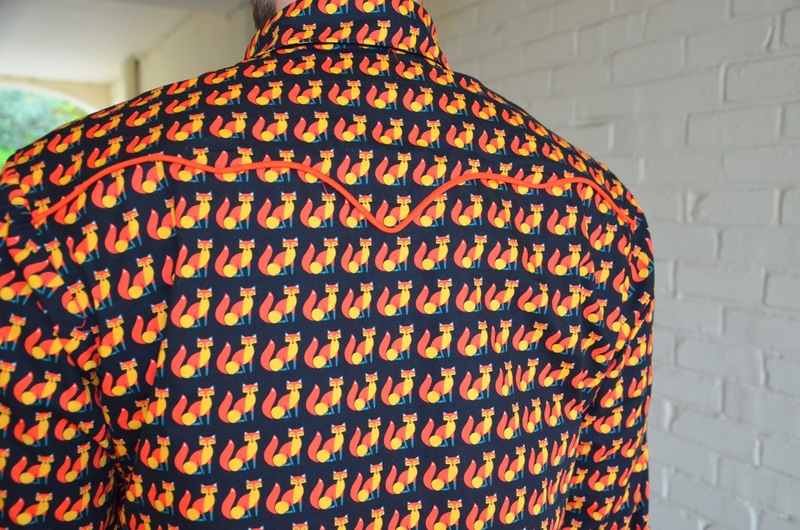 Stephanie of Starcross has made this amazing fox-shirt – have you seen the awesome pattern matching? Pattern matching is something I find tricky, but she has done a great job on those tricky pieces. And who says fun animal prints are for kids? Mr Starcross looked like he loved this shirt so maybe it will inspire you to wear crazier prints. Anne from Pretty Grievances has made a beautiful sun dress in a great summery colour and I especially like the way she has mixed fabrics. I always make dresses from a single fabric but this looks so nice with the contrast bodice I may have to play around with matching fabrics myself. Another dress that plays with layers is the prom dress that Janene from Ooobop made for Nikita. The mesh overlay looks totally different as it is pleated and gathered. The red dress would probably look “nice” on its own, but the way the black dot mesh falls at the waist makes it “wow!” Maybe you can bring new life to something in your stash with a fun overlay? Katie from Kadiddlehopper has made the most adorable kitty dress for Myra! It has a cute kitty face and paw pockets!! I really want to be inspired by this, but am struggling to work out how an adult can pull off paw-shaped pockets… maybe it might be a feature to add to snuggly pjs! Ooooh, fleece animal pjs for winter! Finally there is Gillian of Crafting A Rainbow (and awesome sewcialist of course!) who knows what she wears and sews lots of them. Maybe you’ll be inspired by her to sew what you know works for you! Let us know who has inspired you! I am really looking forward to discovering lots of new-to-me blogs this month. You can tweet or instagram using #tributeaugust and post pictures in the Sewcialists Flickr group! I am so beside myself at this! Wow- you liked it, thank you!